This article is about the World War I volunteer battalions. For the present day Armenian Volunteer Corps, see Armenian Volunteer Corps. The Armenian volunteer units (Armenian: Հայ կամավորական ջոկատներ Hay kamavorakan jokatner) were units composed of Armenians within the Imperial Russian Army during World War I. Composed of several groups at battalion strength, its ranks were primarily made up of Armenians from the Russian Empire, though there were also a number of Armenians from the Ottoman Empire. The Russian-Armenian volunteer units took part in military activities in the Middle Eastern theater of World War I. In August 1914, following Germany's declaration of war against Russia, Count Illarion Vorontsov-Dashkov, the Russian viceroy of the Caucasus, approached Armenian leaders in the Russian city of Tiflis to broach the idea of a formation of a separate fighting corps inside the Russian army made up of the Russian Empire's Armenian subjects. Armenians were already being enrolled in the regular Russian army and being sent to the Eastern front but Vorontsov-Dashkov was offering to furnish weapons and supplies to outfit four detachments that were envisioned to take part in fighting against the Ottoman Empire (the Ottomans would not enter the war until October of that year). His offer was received warmly and within a few weeks Armenian volunteers all throughout the Caucasus began to enlist. Responsibility for its formation was given to a special committee created by the Armenian Congress of Eastern Armenians, which coordinated its activities from Tiflis, Yerevan and Alexandrapol. The establishment of Armenian volunteer units in the Russian army dates back to the summer of 1914. Count Illarion Ivanovich Vorontsov-Dashkov consulted with the Mayor of Tbilisi Alexandre Khatsian, the primate of Tbilisi, Bishop Mesrop, and the prominent civic leader Dr. Hakob Zavriev about the creation of Armenian volunteer detachments. These units would be employed on the Caucasus front in World War I. The Armenian volunteer units were mostly from the Caucasus region and were mostly impatient to take arms "to liberate their homeland". In several towns occupied by the Russian forces, Armenian students were ready to join the Russian Empire's Armenian volunteer army. Besides the regular soldiers of the Russian Caucasus Army, nearly 20,000 Armenian irregular units expressed their readiness to take up arms against the Ottoman Empire. The size of these units increased during the war and Boghos Nubar gave the summary of these units in a public latter to the Paris Peace Conference, 1919 as 150,000 Armenians in the Russian Empire's volunteer units and around 40,000 Armenian irregular units. The acting commander Andranik Ozanian under Viceroyalty of the Caucasus Illarion Ivanovich Vorontsov-Dashkov. Andranik's detachment was assigned to the Persian Campaign along the Tovmas Nazarbekian's. The second, third and fourth units were assigned to the Caucasus Campaign. Drastamat Kanayan and Armen Garo directed the 2nd battalion over the offensives around Lake Van, (Vaspurakan). The 3rd & 4th battalion commanded by Hamazasp and Keri were assigned to the positions along the Kars Oblast. Enver Pasha's offensive had a great chance of success if all three wings of the Third Army could reach their objectives on time. The Ottoman Tenth Army corps, during its march from Olti to Sarikamish, suffered a delay of 24 hours in the Barduz Pass, due to the heroic resistance of the "4th battalion of the Armenian volunteers". This delay enabled the Russian Caucasus Army to concentrate a sufficient force around Sarikamish, resulting in the destruction of the Ottoman Third Army in the Battle of Sarikamish. The acting commander Andranik Ozanian under Viceroyalty of the Caucasus Nicholas Nikolaevich. During the siege of Van there were 20,000 Armenian volunteer units serving in the Russian army. The Russian army entered Van on May 16, 1915. Later on October 15, under heavy fight around the region Lake Van, these battalions had lost five hundred Armenian soldiers and there were more than twelve hundred wounded or missing. The volunteer detachment contingents, fighting under Armenian commanders, were observed in the Russian Caucasian Army as rifle battalions under Russian officers. Around 1916, more than 1,000 Armenian reserve soldiers quit the Russian army in the Eastern Front and joined the Armenian irregular units (Fedayee). The Russian Caucasus Front collapsed following the abdication of the Tsar. In 1917, the Armenian Congress of Eastern Armenians asked the Armenian soldiers and officers scattered throughout Russian occupied regions to gradually be brought together. The plan was to mobilize Armenians on the Caucasian front. With that purpose in view, an Armenian Military Committee was formed with General Bagradouni as its president. These Armenian conscripts and volunteers from the Russian Army later established the core of the armed forces of the First Republic of Armenia. Wikimedia Commons has media related to Armenian volunteer units. ↑ Hovannisian, Richard G. (1967). Armenia on the Road to Independence, 1918. Berkeley: University of California Press. pp. 43–44. ISBN 0-520-00574-0. ↑ July, 1915 Letter from Mr. E. Vartanian, an Armenian-American Volunteer in the Russian Service, to His Brother-in-law in Egypt; Dated 9/22 July 1915, and Published in the Armenian Journal "Houssaper," of Cairo. ↑ [Sv. 2000: T. 30, pp. 101–102]: "On the 6th of May the Armenian flag waved over the citadel of Van. The Vaspourakanis welcomed with great love the Russian soldiers and the Armenian volunteers under the leadership of General Andranik Ozanian." 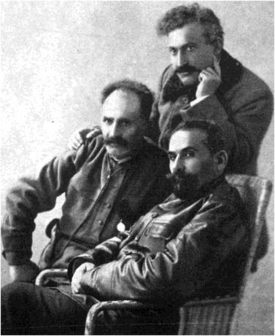 Pasdermadjian, Garegin; and Torossian, Aram. Why Armenia Should be Free: Armenia's Role in the Present War, Hairenik Pub. Co., 1918.